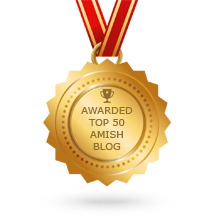 I am both happy and honored to announce that this blog has been named one of the Top 50 Amish blogs. The award was bestowed upon me by Blog.FeedSpot.com, a content reader website. When I viewed the other winners, I was pleased to be included in the list. After all, many folks blog about the Amish. The faithful followers of Roadkill Crossing recognize that I do indeed write about the Amish since my wife and I lived for all of our adult lives among the largest Amish population in the world. However, out of respect to the Amish, I have never claimed to write an Amish blog. I write about them and my experiences with the Amish. Still, I much appreciated the recognition and am happy to share the award with my readers. I am honored to report that today I received the University of Akron’s Wayne College Regional Writers Award for non-fiction. Since I’m naturally too modest to say much about myself, friends and colleagues encouraged me to share this winning essay with you. I have always been enamored by names. By names, I mean the title affixed to something, someone or someplace that transcends the given moniker of the object, the person or the place. When I moved to Holmes County, Ohio many moons ago, I immediately picked up on the custom of speaking in this sort of colloquial code that was neither an accent nor a dialect. People spoke of names for places as if the entire world knew to what and where they were referring. Often times, most of those names could not be found on any official document, including a county map. Still, people used the names as reference points, meeting places and settings for stories, imaginary and true. With apologies to Stephen Colbert, the “truthiness” of the tale didn’t really matter. Once I caught on to this provincial name-dropping, I tried turning the tables on the kids through the lessons. They found it down right sacrilegious to learn that Glenmont had once been Napoleon and Killbuck was first Oxford. Nor did they believe me when I told them that Fort Fizzle had really been a fort, and the cause of its rebellious caretakers actually did fizzle. It was an insignificant skirmish in the American Civil War. But it was our own. The cute terminology wasn’t confined to the schoolhouse either. Once, when I reported to the fire station after the alarm had sounded, I found the first two trucks gone and the station empty. I checked the chalkboard where the type of run and its location were hastily scribbled. “Grassfire, Baddow Pass” was all it said. I was stumped. I had no idea where that was, and had to wait until another volunteer showed up to find out which way we should go. The name game even spilled over to church. When the youth group wanted to go on a hayride to Panther Hollow, I again had to ask about the exact location. When we got there, it was so spooky I thought it should be named Ghost Hollow. But I soon learned that was actually on the north side of the nudist camp. And no, I am not making up any of this. When I moved to the eastern part of the county, I discovered the local names just as prolific, if not more so. Amid the Amish and Mennonite culture, several people have the same name. But there was only one Bicycle Dan and one Toothpick Andy. We had our church picnic in Troyer’s Hollow. The Stink Plant sits on Weaver Ridge. Good friends live on Joe T. hill. In the western, more Appalachian area of the county, the hills are steeper and the valleys are wider. In the east, with its more gently rolling hills, the tranquil valleys are referred to as bottoms. A young woman was once talking with a small group of people about what each valley was called. She said she lived in Bulla (or Bull) Bottom, and that the valley on the north side of Walnut Creek was called Genza (or Goose) Bottom. Like I said, I love these earthy, rural names rich in traditions and full of life, goodness and virtue.